Anti-tank guns with a high muzzle velocity were a German specialty, such as the German 75mm anti-tank and the famous 88. 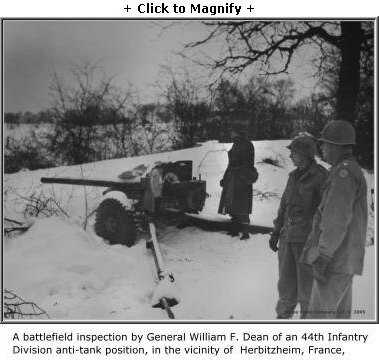 The standard issue American anti-tank gun of World War Two, the Model M-1, 57mm, lacked the punch and penetrating power of its German counterparts. Yet the 57mm proved itself a useful weapon, except when confronted head-on with the latest German battle tanks like the Panthers and Tigers. A proof point is the ad-hoc field testing report, at the bottom of the page. This mobile weapon featured a breech mechanism which ejected shell cases automatically, thereby increasing its rate of fire. A squad of 10 men manned each gun. The M-1 was a reworked British “6 pounder”, so called because it fired a 6-pound projectile. Unimpressive in appearance, the weapon replaced the under-powered American 37mm anti-tank gun. In its day, the ballistics performance was good with a muzzle velocity of about 3000 fpm. An anti-tank (AT) round could penetrate 2 inches of armor plate at 100 yards. British and American ammunition was interchangeable between their “6 pounder” and our Model M-1. Both high explosive (HE) and armored piercing (APC or AT) and High Explosive (HE) ammunition provided a weapon with multi-functional capability. Unfortunately only AT was standard issue to the Americans. The Yanks were thus denied a capable, direct fire anti-personnel weapon. To the Brit Tommies, it was much more than a single purpose anti-tank gun. When confronted with the demand to take out a position, like an observation post or a sniper in a church steeple, the 57mm did the job well. There are many aspects of a scheme and equipment that need to be taken care of, for its success. Accuracy and efficiency are critical for any tool to be accepted by people. Even today, only those programs for trading are accepted by people, which are able to prove their worth. Some of the trading software programs failed in the past as people did not like their complex interface. On the other hand, if you want to know about a fantastic trading program, then click for info. Your decision based on the tips provided by the robot will help you overcome the complex world of Forex and other trading categories. This is one of the most liked programs due to its amazing features like accuracy, success rates, reliability, and ease of use etc. Just like an appropriate weapon is liked by the soldiers. Its combined virtues of relative stealthiness, mobility, accurate direct fire with an HE round: Armed the Brits with a useful ‘sniper cannon.